The science scheme of work has been devised by working back from the key content that students need to be able to achieve the highest grade at A Level and in turn the key content that students need to achieve the highest grade at GCSE. The content that students need to cover within each unit is framed using an over-arching ‘fertile question’, each of which will incorporate different skill strands. For example, while investigating the fertile question ‘Should we be allowed to genetically modify organisms?’ students will be expected to ‘appreciate the applications of science’ & ‘the risks & the ethical issues that arise’. 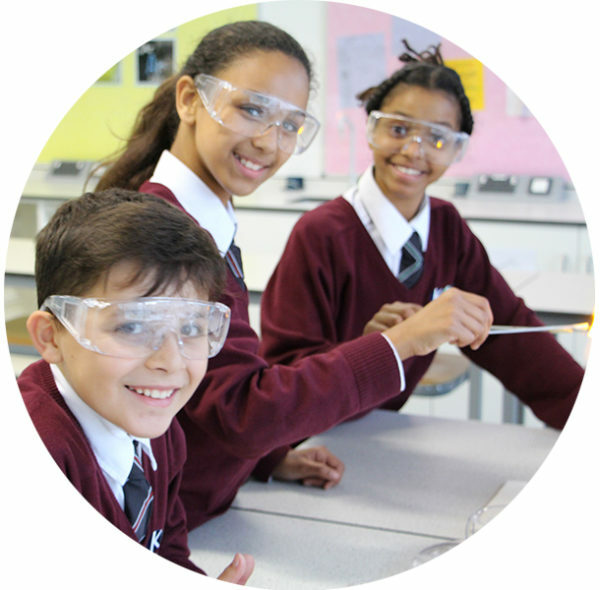 From when they start at KAA, students will develop forms of thinking scientifically to enable them to build knowledge, test hypotheses, analyse and evaluate observations and conclusions, and communicate discovery – this is the ‘whole game’ of science. The content that students need to cover within each unit is framed using an over-arching ‘fertile question’, each of which will incorporate different skill strands. For example, while investigating the fertile question ‘Does everyone have an equal right to a heart transplant?’ students will be expected to ‘appreciate the applications of science’ & ‘the risks & the ethical issues that arise’. Through year 8 students will build on their understanding of the concepts they learnt during year 7 and continue to develop their ability to think scientifically to enable them to build knowledge, test hypotheses, analyse and evaluate observations and conclusions, and communicate discovery. Through year 9 students will build on their understanding of the concepts they learnt during years 7 & 8 before beginning to further deepen their understanding of the specific concepts required for GCSE science. All homework assignments are available on KAA Online, for which every student has a unique login – this allows all students access to the homework regardless of whether they miss a lesson or lose their planner. The Science department also utilises Google Classroom, which allows to complete, submit and review their homework online.